Laube Hall is located just minutes outside of the town of Freeport Pennsylvania and resides within the Freeport Community Park. 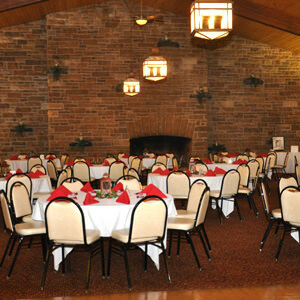 Laube Hall is one of the larger banquet facilities in the Northern Pittsburgh area. They can easily accommodate up to 500 guests with plenty of room left over. 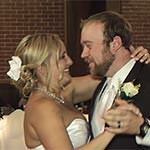 Laube Hall offers you the ability to hold either your wedding ceremony and/or your wedding reception. 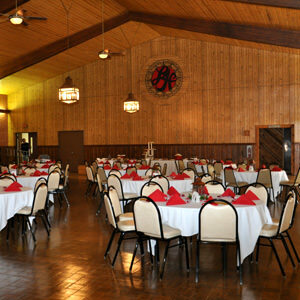 Upon entering the banquet facility, there is a large foyer with plenty of room for a place card table and during winter months they can even provide a coat check with an attendant. From there, you proceed through a second set of doors into the main ballroom. The ballroom has high vaulted ceilings with wooden beams. At one end of the room is a large (floor to ceiling) stone wall with a built in fireplace and all stone hearth. Accenting the fireplace are lit candles that add to the uniqueness of the room. Lighting is provided by several fully dim-able hanging chandeliers, as well as up lighting that spans the length of the room. The floor is carpeted and in the center of the room is a very large wooden dance floor. On one side of the ballroom is an extremely large commercial kitchen, as well as a second room which will house your buffet line for dinner. The beauty of this room is that it allows the caterer direct access from the kitchen and also has 2 doors (one at each end) that allows for a smooth flow of guests as they proceed through the buffet. This maximizes the floor space within the main ballroom, since you do not need to allot an area for the buffet tables. Also situated on that wall is a large built in bar with ample room for multiple bartenders. On the other side of the room are multiple doors leading to an outdoor balcony with an incredible view of the Allegheny River and Freeport Bridge. This uncovered balcony spans the length of the hall and is lined with Tiki Torches, making it a nice area for your guests to mingle, or just get some fresh air. On the lower level is a large covered patio which is perfect for an outdoor wedding ceremony. 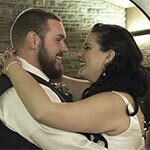 Also located on the lower level are a couple of smaller rooms that can be used as a bridal suite prior to introducing the bridal party into the main hall. Laube Hall allows brides and grooms the option of choosing their own caterer. This allows you both flexibility and the potential to save some money. Since Laube Hall does not have a liquor license, brides & grooms provide their own alcohol. Again, this can result in a tremendous cost savings for thrifty couples.